Some amazing stonework going on at the FDR Library as part of our renovation has brought to mind that many great buildings and monuments were erected with the assistance of the Order of Freemasons, or Masons. And many U.S. presidents, including FDR, were members of the Masons. Franklin Roosevelt was initiated October 10, 1911, passed November 14, 1911, and raised November 28, 1911, in Holland Lodge, No. 8, New York City. 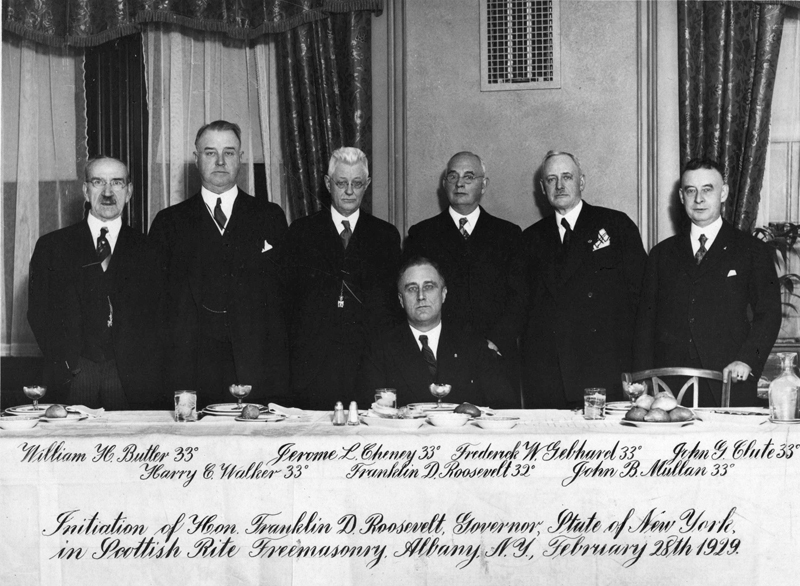 FDR at his induction into the Albany lodge on February 28, 1929 (while he was Governor of New York). He petitioned the Ancient Accepted Scottish Rite in the Albany Consistory of New York, February 28, 1929, and received his 32nd degree the same day. On March 26, 1930, he became a Shriner in Cyrus Temple, AAONOMS (Ancient Arabic Order Nobles of the Mystic Shrine), Albany, New York. He was also a member of Greenwood Forest, Tall Cedars of Lebanon in Warwick, New York. On October 30, 1931, he was made a Prophet at Sight in Tri-Po-Bed Grotto, MOVPER (Mystic Order Veiled Prophets of the Enchanted Realm) of Poughkeepsie, New York. 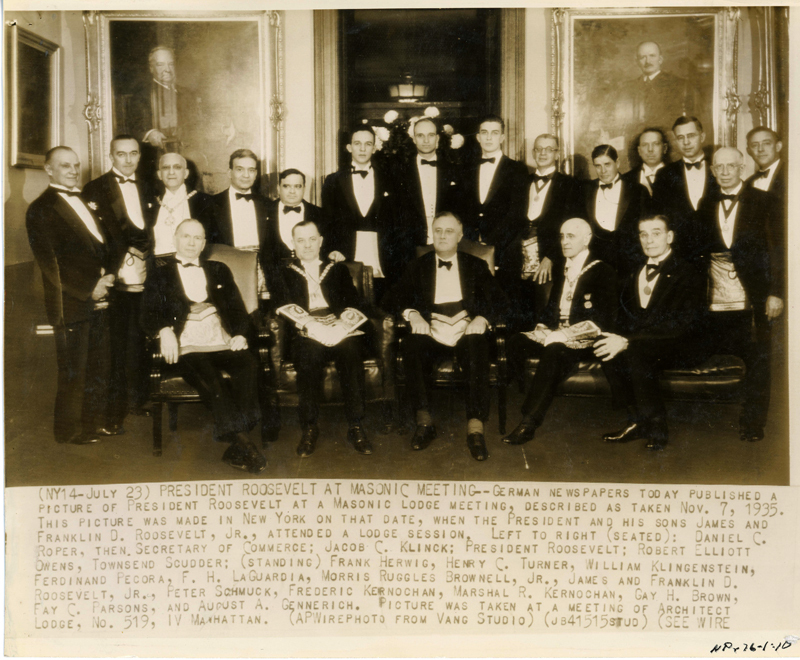 Franklin Roosevelt held a number of honorary memberships in various Masonic lodges, among them in the Architect Lodge, No. 519, New York, where he raised his sons, Franklin, Jr. and James, on November 7, 1935. He was also an Honorary Grand Master of Georgia, and, in 1934, was made Honorary Grand Master of the Order of Demolay. There is no evidence that FDR was given any type of Masonic rite as part of his funeral, or that he was buried dressed in Masonic apron. Holland Lodge : This group of items from FDR’s papers relate to his membership in Holland Lodge No. 8, including the earliest membership card we could locate as well as the last membership card sent to the President in March 1945. Speech Materials : These documents are from the President’s Master Speech file and include FDR’s draft of the speech he gave to the Architect Lodge on November 7, 1935 when Franklin and James were raised, as well as an excerpt from a press conference the previous day where he talks about the upcoming ceremony. FDR at the initiation ceremony for James and Franklin, Jr. at the Architect Lodge in Manhattan on November 7, 1935.